One of the aspects of Disney that’s so appealing to many people is the attention to detail in any project. Whether it’s a film or theme park, Walt Disney always wanted to tell a story. In order to more successfully immerse the audience in that story, he was passionate about the details. Sometimes when visiting Disney Parks, I’m so overwhelmed with the atmosphere it’s easy to overlook those important details. 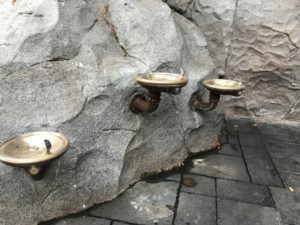 With each visit to Magic Kingdom at Walt Disney World Resort (and there have been scores of them), I discover new elements I never noticed before. But over time, certain aspects become familiar. I know where to find the hidden Mickey in the Haunted Mansion ballroom scene, when to expect the drop in Pirates of the Caribbean, and when to pose for my attraction photo on Space Mountain. So, when I visit Disneyland Resort, and find some of the details to be just slightly different, I notice. At Walt Disney World, the music soundtrack which plays while you’re in queue at Jungle Cruise has periodic interruptions by an announcer with jokes fit only for an attraction like the Jungle Cruise. The announcer at Disneyland is mysteriously missing. 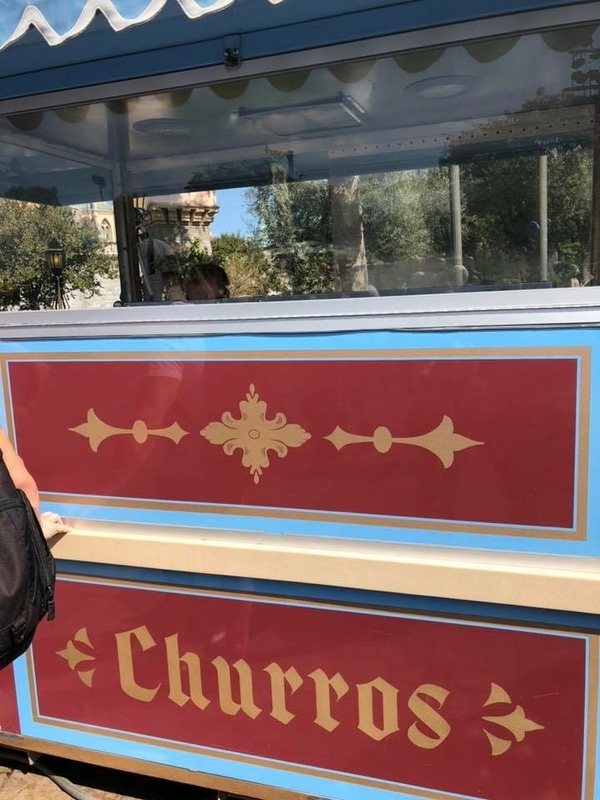 Maybe he stepped out for a churro. Speaking of churros – as Tinker Belle Diva discovered, they are a much bigger deal in Disneyland than they are at Walt Disney World. Be prepared to spend much more time outside at Disneyland. With (typically) more temperate and drier air in California, many of the queues and even the attractions themselves are outside. You probably know that Disneyland is much smaller that Walt Disney World. (Fun fact: All of Disneyland could fit in just the parking lot of Magic Kingdom at Walt Disney World Resort!) Limited space at Disneyland means the Imagineers need to be that much more creative in how they use their real estate. Instead of going “out” they often go “up.” It’s not unusual to walk up (and sometimes back down) steps while going through an attraction queue at Disneyland. At Walt Disney World, it’s a small world is completely inside. At Disneyland, it begins and ends outside. 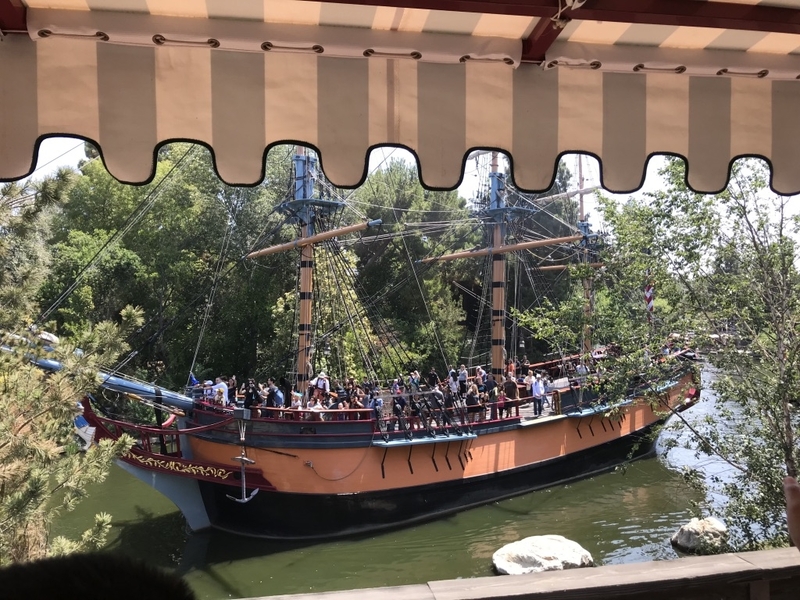 At Disneyland, you have almost a zero chance of getting wet during the battle scene between the ships in Pirates of the Caribbean. At Walt Disney World, it’s a small world passes by a restaurant. In Disneyland, Pirates of the Caribbean does. California water doesn’t taste like it came from a swamp. Peter Pan’s Flight is a HUGE deal at both parks, but the pixie dust to automatically lower the safety bar only works at Walt Disney World. In Disneyland, the blasters you use in Buzz Lightyear’s Astro Blasters are tethered to your vehicle, but you can actually pick them up and move them around while trying to score points. In Disney World, at Buzz Lightyear’s Space Ranger Spin, the blasters are mounted to the car – you can’t pick them up. The drop in Pirates of the Caribbean is much smaller at Walt Disney World than at Disneyland. And there are two of them at Disneyland. Disneyland doesn’t use Magic Bands. 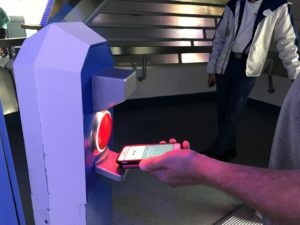 Walt Disney World doesn’t use MaxPass. You can still get a paper FastPass at Disneyland. You can get 3 FastPass+ before you even enter a park at Walt Disney Word. The monorail at Disneyland does not have air-conditioning. The seats on train cars of the Disneyland Railroad are parallel to the track. At Walt Disney World, the seats are situated in the more typical fashion – perpendicular to the track. Disneyland’s Rivers of America is home to both the Mark Twain Riverboat and the Columbia Sailing Ship. Walt Disney World only has the Liberty Belle Riverboat – no sailing ship. 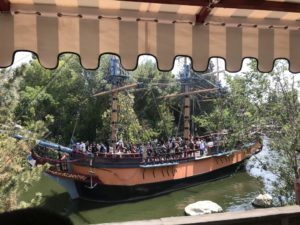 While much of the middle of Pirates of the Caribbean is the same at both parks (there’s a battle scene, an auction scene, the fire, and of course Captain Jack Sparrow) the beginning and ending of the attraction are very different at each park. Attraction photos are automatically linked to your Memory Maker at Walt Disney World. 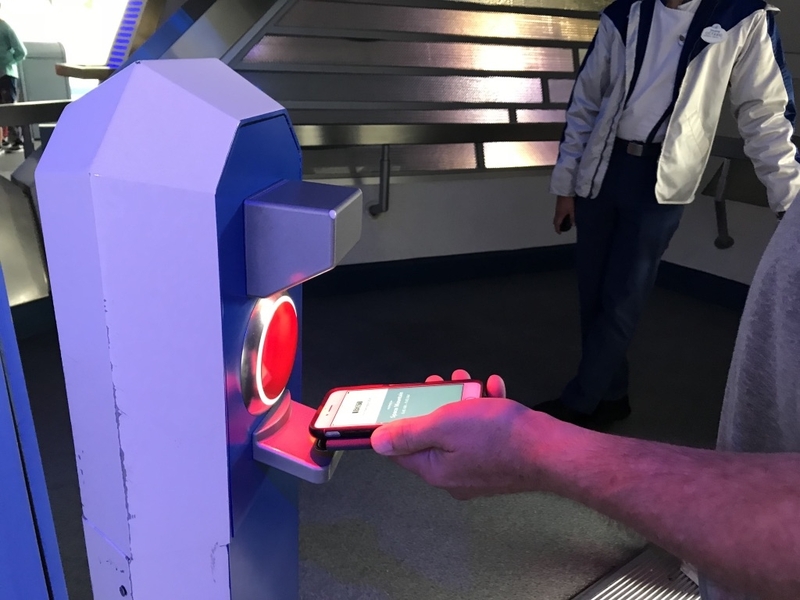 If you want your photo linked to your MaxPass, you need to manually enter the photo number to your account. Guests at Space Mountain ride single file, three to a car in Walt Disney World. At Disneyland, you’ll ride 2-by-2, with six in a car. There are no stormtroopers patrolling at Magic Kingdom in Walt Disney World. (You’ll find them out in force (pun intended!) at Hollywood Studios.) Walk around Tomorrowland in Disneyland, and you may find yourself answering to the Empire. 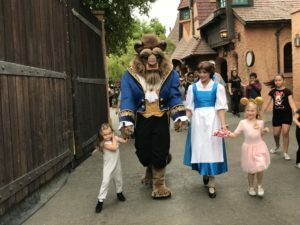 And on the topic of characters roaming the park – you’re much more likely to find that happening at Disneyland than you will at Magic Kingdom in Walt Disney World. The ship you fly in for Peter Pan’s Flight will come to a stop for you to board at Disneyland. At Walt Disney World, you’ll need to walk on board as it merely slows down. The targets you shoot at on Buzz Lightyear’s Astro Blasters in Disneyland are different shapes (circles, squares, diamonds) and they periodically light up to signify possible bonus points. The targets at Walt Disney World are all just Z’s. The boats at it’s a small world are much narrower in Disneyland, seating about three adults. The Walt Disney World boats can easily seat four. If you’re arriving at Disneyland at a non-peak time of day, you may need to go through the regular security line, even if you don’t have a bag. At Walt Disney World, you always have an option of using the “no bag” line at security. Disneyland has MaxPass, Walt Disney World has FastPass+. 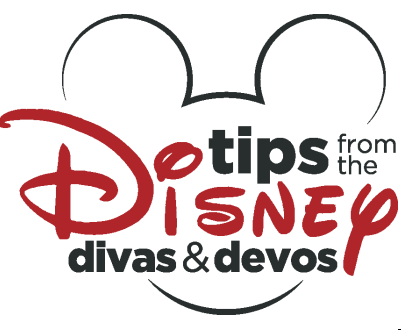 Both have advantages and disadvantages, but it may take an advanced degree in Disney Planning to fully comprehend and understand all the differences. 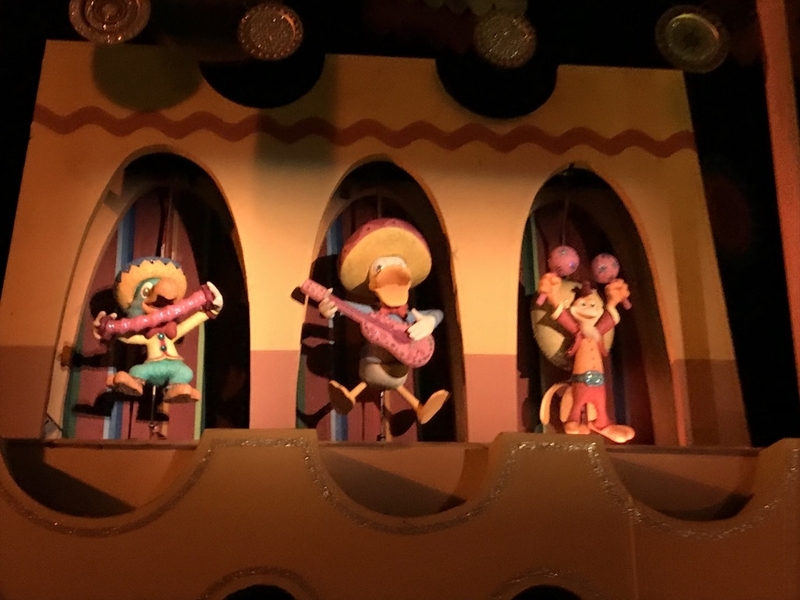 Look for familiar Disney characters in it’s a small world at Disneyland. We spotted Alice, Peter Pan, Tinkerbell, Pinocchio, Lilo, Stitch, Jessie, Woody, Bullseye, Nemo, Dory and The Three Caballeros. I’m sure there are more! No such character sightings at Walt Disney World. The monorail at Disneyland runs through Downtown Disney. At Walt Disney World it goes to Epcot. There aren’t “good-bye” signs in various languages at it’s a small world in Disneyland, but there are postcard greetings at both the beginning and end of the cruise. If you’re looking for a Dole Whip, you can find one at the Tiki Juice Bar at Disneyland. And if the line outside is too long, go to the other side of the stand. They take orders on BOTH sides! At Walt Disney World, you can find Dole Whips in several locations throughout the four parks, but none has two-sided ordering. Walt Disney World has two Dumbo rides – Disneyland has just one. There’s a mine explosion on Big Thunder Mountain in Disneyland, but no such scene at Walt Disney World. You can actually walk around inside Sleeping Beauty Castle in Disneyland. A short self-guided tour takes you past beautiful dioramas which tell the story of Sleeping Beauty. If you want to walk around inside Cinderella Castle in Walt Disney World, you’ll need reservations to dine at Cinderella’s Royal Table. At Disneyland, we noticed water fountains at three different heights to accommodate guests of all sizes. 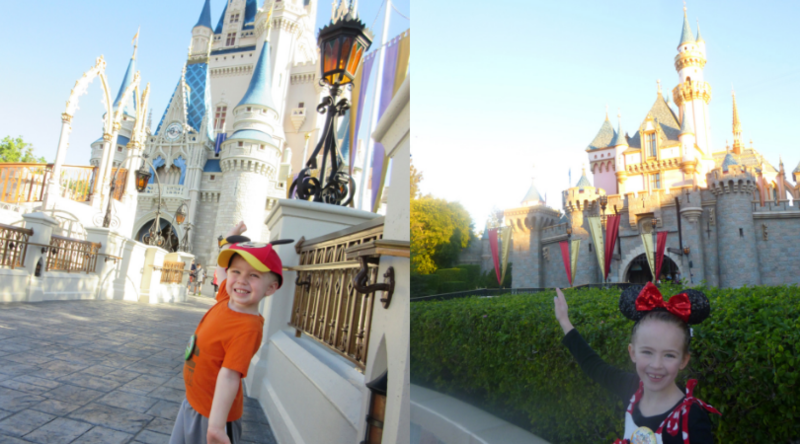 We’re not surprised to see two heights at Walt Disney World, but don’t recall ever seeing three options. At Walt Disney World, while cruising in your boat on it’s a small world you feel like you’re navigating an ocean because the water extends beyond the path you’re sailing. The “Hunny Pots” you ride in for The Many Adventures of Winnie the Pooh are more suited to Pooh sized people in Disneyland than they are in Disney World. On Splash Mountain in Disneyland, guests ride single file; at Disney World you ride 2-by-2. Disneyland has Great Moments with Mr. Lincoln, and Disney World pays tribute to ALL of the presidents in Hall of Presidents. The fire station at Disneyland has a small detail which is immensely important. Look up, and you’ll see a light in the second story window. When Disneyland was being built, and even after it opened, Walt often stayed here in an apartment built for him. You would know he was there if the light was on. Today, the light still glows, as a tribute to him. 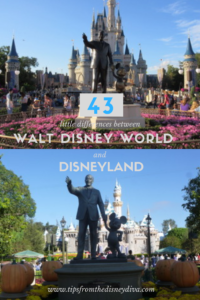 These are just some of the differences my family has noticed between Walt Disney World and Disneyland. We know there are many, many more! What have you noticed? Or, if you haven’t made it to both parks yet, I know someone who can help you make that dream come true! Contact Patricia at All for Dreams Travel for your FREE quote and start planning your next Disney trip. Then let me know what differences you find!